Gloria Coronado, PhD, is an epidemiologist and the Mitch Greenlick Endowed Senior Investigator in Health Disparities Research at Kaiser Permanente Center for Health Research in Portland, OR. Her research focuses on understanding and addressing disparities in the occurrence and burden of disease in underserved populations, with a special emphasis on testing cancer prevention intervention in underserved and Medicaid-enrolled populations. She has developed several innovative and cost-effective interventions to improve rates of participation in cancer screening among patients served by community health centers. Her work has led to partnerships with large health plans, state institutions, and clinics who serve migrants and the uninsured. 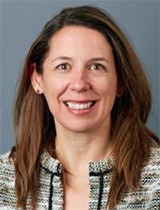 Dr. Coronado received her PhD in epidemiology from the University of Washington and became a research associate professor in the university’s Department of Epidemiology, in addition to receiving training at Stanford. She currently directs or co-directs three programs that use systems-based approaches to raise the rates of colorectal cancer screening in health plans and clinics in Washington, Oregon and California.